its ok i have step ladders lol..
You said that about your blue bike iirc. i will have to make a guard up indeed..
well fired the mighty drummond up this evening and first job strange enough was a storm flywheel.. this big girl fair rips into Honda's finest, a bit longer to set up but i get the time back once i hit the loud button. beside an old scrap one for size comparison. yes im a bit strange but i find it relaxing to chill out with a cuppa and a vape and watch something new appear outa something big and old. 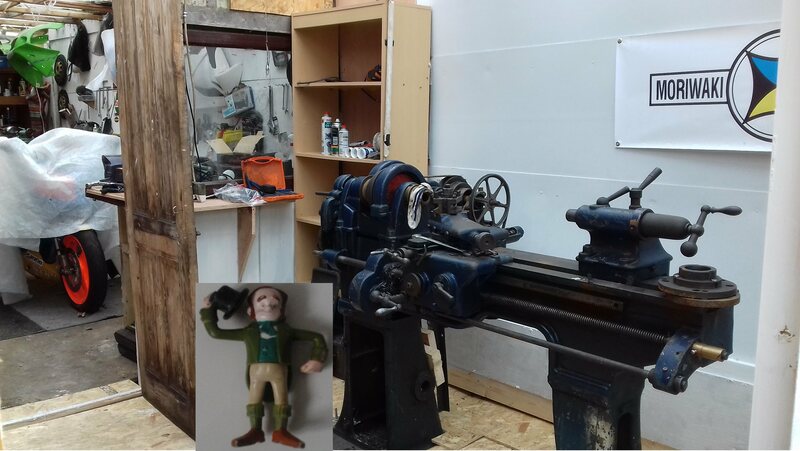 well as i will still be using the wee lathe (iv become attached to it lol) and sick of chips and swarf over everything i moved it into the new west wing. so much more room to work at the bikes now. Now that is what you call a machine shop, just a vertical mill and a surface grinder and you can give up work. a nice vertical drill and id be happy ... was looking at mills mmmmmmmmmmm but jesus were does it end lol.